Here is another project I made using the Ghoulish Googlies Designer Kit. I used the Glassine bags - how cute are they! They remind me of when I was a little girl getting 20c of mixed lollies in the little white bags from the milk bar. They are a lot smaller than I expected but great for party favours or little gifts. I ran the bag through the bigshot and the spider web folder. I then rubbed over the top with the Basic Grey ink pad. I stamped the spider onto one of the little tags that come with the kit. Punched out a 2 3/8 scallop circle and layered them with a glimmer brad (black of course). A small snip of some old olive 1/8" Taffeta Ribbon tied in a bow and it is all done. Paper: Basic Black, Double sided tag from Ghoulish Googlies kit. Cool Tools: Spider web Embossing Folder, Big Shot, 2 3/8" Scallop Circle Punch, Black Glimmer Brad, Old Olive 1/8" Taffeta Ribbon, hole punch. 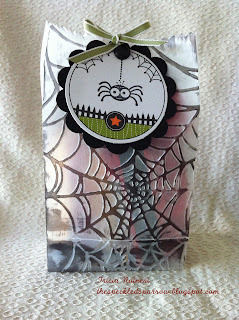 Labels: Ghoulish Googlies Designer Kit, Glassine Bags, Holiday Catalogue, Spider Web Embossing Folder. How cute are those Googly Ghouls in the Holiday Mini? Just because we dont celebrate Halloween around here doesn't mean I cant play right? When my order arrived just the other day and I couldn't wait to crack open the Ghoulish Googlies Bundle. It has 20 double sided tags, 10 Glassine bags (these are made from a kind of see-through smooth paper), 50 Googly eyes with adhesive backs & 10 pieces of Pumpkin Pie/Whisper White Twine. I got to work and made a few projects using this kit and the Howlstooth & Scaringbone DSP which not only coordinates with Halloween projects but has so many cute designs I can see this being used for everyday cards. 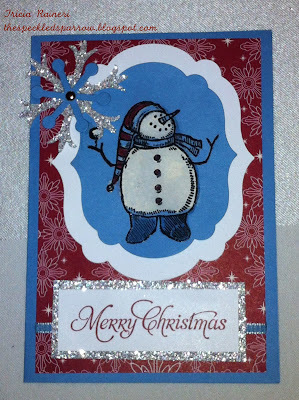 Here is my 1st project - A card inspired by one I saw on Pinterest recently. You can find it Here. It is a nice easy card using only one stamp set & a few scraps of DSP & card stock. I didn't even use the googly eyes on these little guys ...but you could add them easily if you could find where you put them! 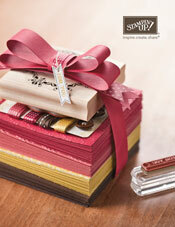 Cool Tools: Paper snips, 1" Square Punch, Whisper White Twine, Dimensionals, Dotted Scallop Ribbon Border Punch. Just popping in to let you know that as of the 25th September the Peppermint Sticks Scented Embossing Powder in the Holiday Mini (page 16) is no longer available for purchase. Stampin' Up! have had trouble with the formula and the longevity of the scent so have decided to no longer carry this item. Okay, so that was my attempt at a play on words....but you get my (snow) drift ;) My big box of new catalogue stamp sets arrived the same day as I was organising my stamp club projects and well....one thing led to another and before I knew it I had whipped up a new card and sample for the class. I wanted to focus on Bleaching this stamp club and after seeing Janine Rawlins presentation at Regionals ( click on her name and it will take you to her samples), I figured the Snow Much Fun snow men would work beautifully. Then I spied the new Be of Good Cheer DSP out of the corner of my eye and it all came together. 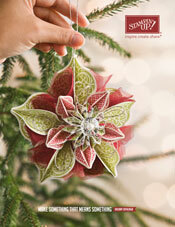 I have used a few new catalogue items here, including the new Snow Flurry die. Stamp Sets: Snow Much Fun, Many Merry Messages. Paper: Marina Mist, Whisper White, Silver Glimmer Paper Be of Good Cheer DSP.Ink: Bleach, Cherry Cobbler & Marina Mist Markers.Cool Tools: Big Shot, Bigz Snow Flurry Die, Silver Brads, Framelit - Labels Collection, Paper snips. I was asked recently how you go about reinking the new firm Foam ink pads. Well...after a little research I found a great video by Patty Bennett that explains it better than I ever could! It is a very quick 2 minute VIDEO TIP especially for those of you that are wondering about reinking your new Stampin' Up! Firm Foam Ink Pads. Another punch art production. This time I chose to make some cute little Christmas Elves. There were 21 of these little guys too but I forgot to take their photos all together! 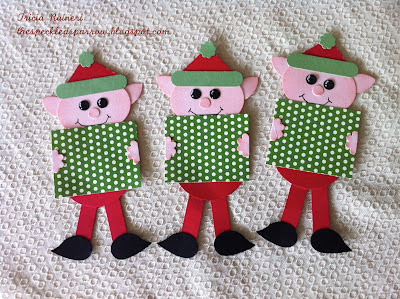 These elves were a lot harder to make than the foxes and involved a lot more punching. I am going to have big muscles by the end of the week I can tell you! I love a good swap and this one was really enjoyable. Punch art is something I don't do much but do enjoy the result afterwards. Paper: Red Red, Pink Pirouette, Basic Black, Wild Wasabi, Be of Good Cheer DSP. Ink: White Gel Pen, Blushing bride (sponging), Basic Black Marker. Cool Tools: 1" Square Punch, 1 3/4" Circle Punch, Bird Builder Punch, Word Window Punch, Hole Punch, Boho Blossom Punch, Itty Bitty Shapes Punch, 5 Petal Flower Punch, Ornament Punch, Paper snips. Those of you that came to Paperific may have had the opportunity to make one of my Scentsational Season cards at one my make & take sessions. They were clean and simple as we were pushed for time but with a bit of embossing powder, an embossing folder or glitter they could easily be stepped up for a more detailed card. I think they would be great for a stamp-a-stack or something similar. Cool Tools: 1" square punch, Framelits - Labels Collection, Framelits - Scentsational Season, Dimensionals. Yes your eyes are not deceiving you - there are 21 foxes there on my kitchen table! I have been busy getting my punch art swaps organised for a swap I joined on Stampin' Connection. When you join as a demonstrator with Stampin' Up! 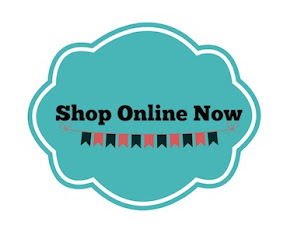 you get access to the Stampin' Connection forum/website & the best thing is it is now Worldwide! I have met lots of lovely ladies from Australia and now USA, Canada, UK, Germany & France just from this site. 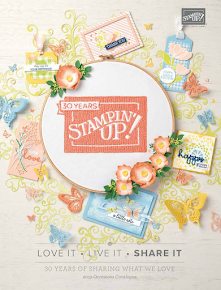 There are thousands of ideas and samples, discussions and groups all with Stampin' Up! Demonstrators only. It's a great place to share ideas, learn something new or even discuss your problems. They also trade stock and organise swaps. I love punch art but am limited to using the Stampin' Up! Punches I own. As you can see I am making foxes! This little one is made from the Pennant punch and is based on one Marelle Taylor did a while back. I am also making another little man with a Christmas twist....but you will have to check back to see him. 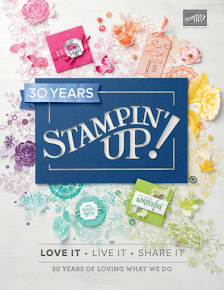 Now is a great time to join Stampin' Up! As a demonstrator you will have access to not only the Stampin' Up! Site but also the forum. The new kit is fully customisable and priced at only $169. It's your choice to put together a kit with any of our current products- you can choose up to $235 worth of any Stampin' Up! products! You also receive a business supplies pack (valued at $80) to create a kit with a total value of $315 that still ships for FREE! Call or email me for a FREE information pack. Cool Tools: Extra Large Oval Punch, Large Oval Punch, Pennant Punch, Owl Builder Punch, Hole Punch, Paper snips. Last weekend was Paperific in Melbourne and I had the good fortune of working 2 days this year. The Friday was busy and I was so happy to see many of my customers pop in to the stand and say hi! The new catalouge was a popular choice amoung visitors to the stand with many coming by to grab themselves one of each. The Sunday was Father's day and was therefore really quiet and relaxed and I had the opportunity to chat to people and do a little shopping myself. I even ran a small class in the morning and met lots of new crafty men & ladies. 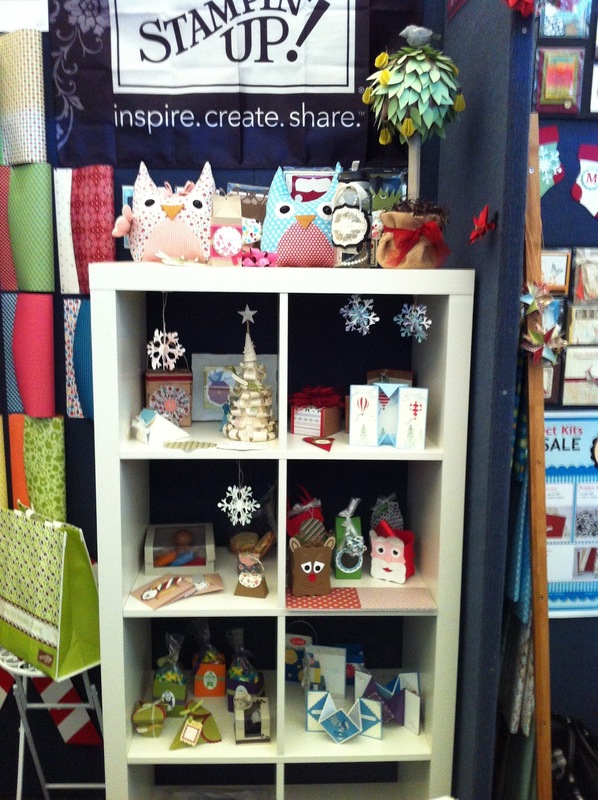 Sunday is the BEST shopping day at Paperific with many stalls marking down their product to 20-50% off RRP. Of course if you are after that elusive die or punch do not leave it till the Sunday as they will be all gone! Lots of great displays here - top shelf featuring my fabric owls & Jess's partridge in a pear tree. How cute are those little snowflake decorations?! Simone's No Peeking Board - love it! Some scrapbook pages on display. Ok, so did you go to Paperific? What was your favourite thing to do at Paperific? Any tips for us newbie Paperific goers? Today I was in need of a 9 year old boy gift card holder....and knowing 9 year old boys like I do I knew it called for a bit of Angry Bird action. There are so many different Angry birds and choosing one was difficult, so I chose 2! I made what I call the "black one & the red one". Please excuse my lack of knowledge of Angry Birds - I have no idea when it comes to these birds what their actual names are. Perhaps the recipient can enlighten me. While I have made a few of these Angry Birds in the past, special thanks goes to Leonie who sent me through instructions on how to make these little guys. You can see her cards featuring them on her blog HERE. It is safe to say she is a punch art perfectionist! 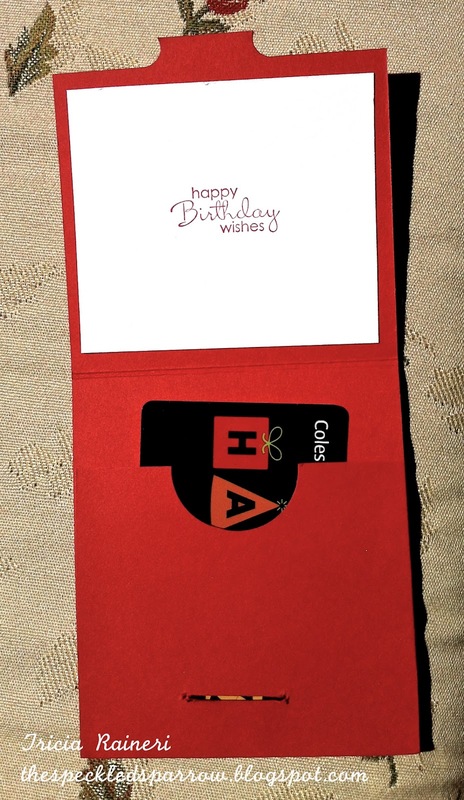 Paper: Real Red, Whisper White, Basic Black, Daffodil Delight, Basic Grey, Big Top Birthday DSP(Retired). Ink: Real Red, Basic Black Marker. Stamp sets: Grunge Rock (Retired), Petite Pairs. Cool Tools: Boho Blossom Punch, Small Heart punch, 1 3/8" Circle punch, 1 3/4" Circle punch, Word Window punch, 1/2" Circle Punch & 3/8" Circle punch (from Itty Bitty Shapes punches), Paper snips. 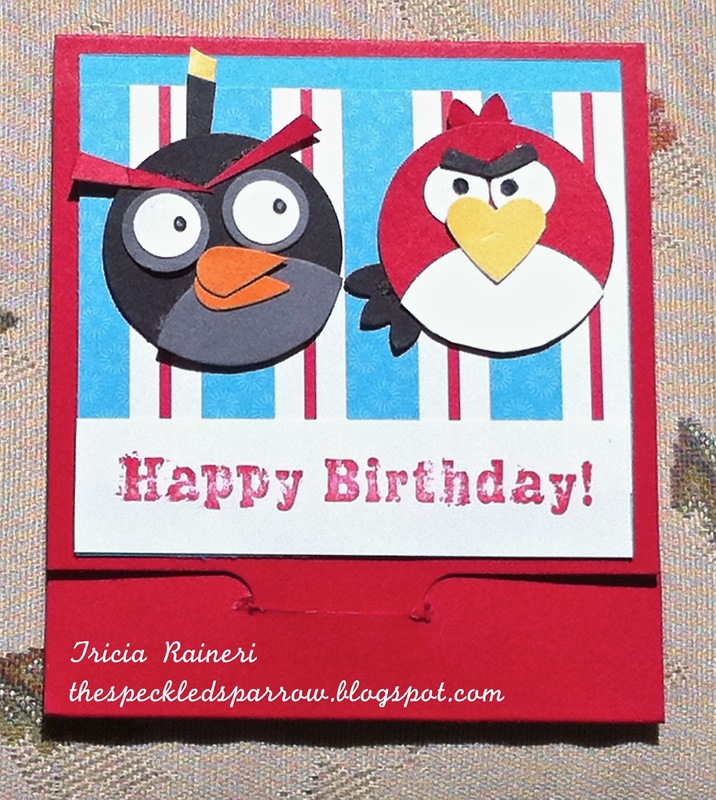 Labels: Angry Birds, Boy Card, Gift Card Holder, Grunge Rock. Hooray! The new catalogue for 2012-2013 is finally here! I have added links to them on the right hand side of my blog and also below so click away ;) For those of you who have not received your new catalogues, please let me know and I will send some out to you ASAP. Now, with two catalogues to choose from, my wish list is quite large....how about you? 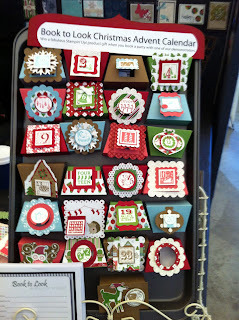 I love all the new holiday catalogue things and cant wait till I can get creating with them! For those of you admiring the ornament on the front of the Holiday catty I will be running an ornament class that will include that amazing ornament plus a few extras. Stay tuned for more info on this in the upcoming weeks. Labels: 2013-2013 Annual Catalogue, Holiday Catalogue.